How far have we traveled down the road to authoritarianism and how robust are our institutions to defend against threats to liberal democracy? Just weeks ahead of the midterm elections, PEN America and the New School presented Timothy Snyder and Jason Stanley in this urgent and necessary conversation moderated by The New Yorker’s Jelani Cobb. 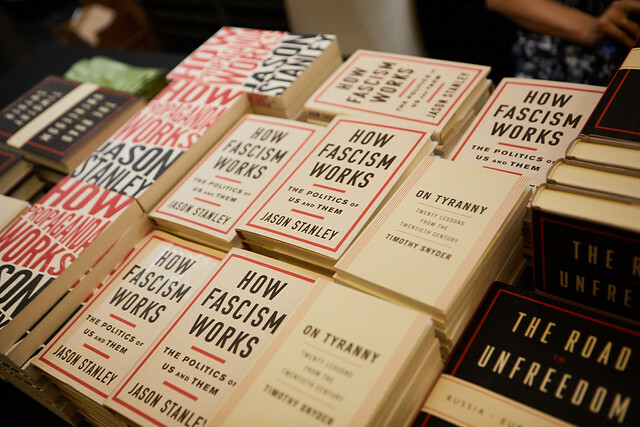 Timothy Snyder’s new book, The Road to Unfreedom, has been described by TIME as an “essential, penetrating look at how toxic ideas, autocratic power and fake news spread from Russia into Ukraine, Western Europe and now to the White House.” Yale philosopher Jason Stanley’s How Fascism Works: The Politics of Us and Them identifies the 10 pillars of fascist politics and charts their history and relevance to the United States today. Presented in collaboration with the Milano School of Policy, Management, and Environment, the Office of Social Justice, and the Executive Dean’s Office at the Schools of Public Engagement at The New School. Jelani Cobb has been contributing to The New Yorker since 2012, and became a staff writer in 2015. He writes frequently about race, politics, history, and culture. His most recent book is The Substance of Hope: Barack Obama and the Paradox of Progress. He’s a professor of journalism at Columbia University. He won the 2015 Sidney Hillman Prize for Opinion and Analysis Journalism, for his columns on race, the police, and injustice. Timothy Snyder is an author, historian, and the Levin Professor of History at Yale University. His books include Bloodlands: Europe Between Hitler and Stalin, which won him the Hannah Arendt prize for political thought; Black Earth: The Holocaust as History and Warning; On Tyranny; and The Road to Unfreedom: Russia, Europe, America. Snyder is a member of the Committee on Conscience of the United States Holocaust Memorial Museum. Jason Stanley is the Jacob Urowsky Professor of Philosophy at Yale University. He is the author of five books, including How Propaganda Works (Princeton, 2015), winner of the 2016 Prose Award in Philosophy from the Association of American Publishers, and How Fascism Works: The Politics of Us and Them (Random House, 2018), called by historian Jan T. Gross a “must-read for all of us who take seriously our responsibility as citizens.” Stanley serves on the board of the Prison Policy Initiative, and writes frequently about propaganda, free speech, mass incarceration, democracy, and authoritarianism for The New York Times, Boston Review, and The Chronicle of Higher Education.